A hiker’s attire is all about practicality. Substance over style. We need items that will keep us dry when it’s wet, warm when it’s cold and cool when it’s hot. Breathable. Comfortable. Lightweight. Durable. Affordable. Did I miss anything? Oh yes, for purposes of weight and space, all of these attributes should be accounted for in as few as items as possible. Is all that too much to ask for? By dressing in multiple lighter layers, as opposed to a single thick or bulky layer, the hiker is able to better adapt to a wider range of conditions. Layers can be removed or added according to the weather and/or exertion level at any given time. Ideally your clothing selections should compliment one another, so that each layer works together as part of a flexible overall system designed to maximize efficiency and minimize duplicity. If the conditions demand, you should be able to comfortably wear all of your clothing simultaneously. When it comes to the outdoors, there are three principal layers: Base, Insulation and Outer. The foundation layer worn next to the skin. Keeps the skin dry by wicking away moisture. Ideally it should be lightweight and dry quickly. Avoid cotton which clings to the skin when wet, doesn’t insulate and takes longer to dry. Options: Merino wool, polyester, silk and polypropylene. In three season conditions, I usually wear a polyester long sleeve collared shirt. Lightweight and breathable, this has been my base layer of choice since the 1990’s. The long sleeves afford protection against the sun in hot, shadeless environments, yet also provide warmth when the temperatures get cooler. In cooler conditions, I will go for a merino wool base layer (e.g. Icebreaker), the weight of which will vary according to the temperature (i.e. the colder it is, the heavier the baselayer). Click here for a comprehensive overview of the pro’s and con’s of merino wool and synthetic base layers from the staff at Backpackinglight.com. I have always hiked in shorts (nylon or polyester) rather than pants. Personal preference. Shorts feel less restrictive; particularly when walking uphill. In hot, shadeless conditions I will use sunscreen, which along with my natural hairiness provides all the protection I need. 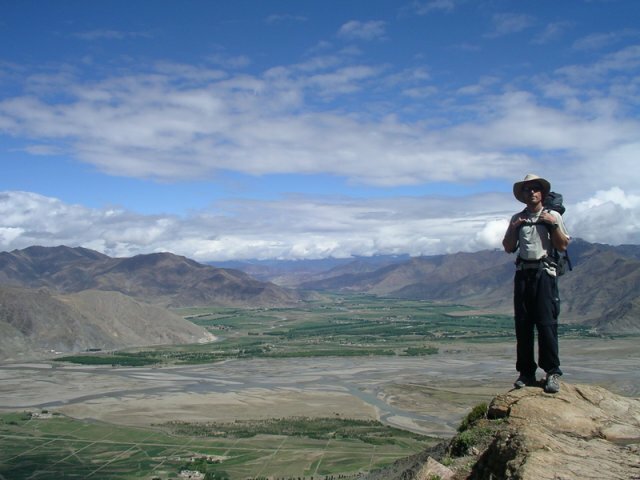 The only exceptions to my “shorts policy” is in consistently sub-zero temperatures, or if I am hiking in countries such as Pakistan or Tibet where the wearing of shorts is not considered culturally appropriate. In such cases I will wear lightweight synthetic hiking pants. For cooler night time conditions, I usually wear thermal underwear made of Patagonia Capilene or merino wool. The warmth layer/s. Works by trapping dead air space. Keeps the warm air in and the cold air out. Manages the moisture from the wicking or base layer through a balance of absorption and letting excess moisture escape through its fibres. Can be multiple items, depending on the temperature and conditions. More than one insulating layer gives you increased flexibility; particularly important when you are likely to encounter a broader range of temperatures. Options: Fleece, down and synthetic fibre variants such as Primaloft and Polarguard. In cold and dry conditions I generally use a down vest or jacket as my principal insulating layer. Down offers the best warmth-to-weight ratio, however, is not well suited to areas subject to regular heavy rainfall. In cold and wet conditions, I usually go for a fleece or synthetic fibre item, which tend to perform better than down products when wet. Unless the temperatures are consistently well below zero, in which case you may consider carrying down pants, a combination of thermal underwear and water resistant or waterproof pants should suffice to keep your legs warm. Protection from the wind, rain and snow. Generally waterproof or water resistant garments, that are quick drying, durable and often (though not always) breathable. For the upper body, in cold and dry conditions (e.g. beginning of spring or end of Fall in the desert) I will generally wear a Wind Shirt/shell. These garments are lightweight, very breathable, water-resistant and as the name suggests, keep the wind out. What they won’t do is keep you dry in consistently wet weather. In such conditions, I will normally be packing a poncho tarp, which in addition to acting as my shelter, will also keep me dry on the off-chance that it rains. In cold, constantly rainy conditions, I have found an outer layer made of eVent, Gore-tex or a comparable microporous membrane, provides the best overall combination of “waterproofness” and breathability. It should be noted that irrespective of what certain outdoor companies may claim, there is no material that I’m aware of that will keep you completely dry if it rains hard enough for an extended period of time. For the lower body, in cool and dry conditions I will wear featherweight windpants. In cool and wet conditions, I go with a slightly heavier (though still relatively light) waterproof model. Breathability: Although ponchos may be waterproof, they are not breathable. Common poncho tarp fabrics include silnylon and cuben fiber. That being said, when it comes to ponchos, the lack of breathability is somewhat offset by the loose fitting nature of the garment. Horses for Courses: Poncho’s don’t do so well in driving wind and rain. By no means the outer layer of choice for places such as Scotland, Tasmania or the south island of New Zealand. On the other hand, they are ideal for arid environments or easy to follow protected trails in thick forests (i.e. the trees act as a natural wind & rain break). Campsite Selection: If you choose to carry a poncho tarp in cold, wet and exposed conditions, by necessity you will need to place a higher emphasis on campsite selection. The more protected the site, the more comfortable you will be. Bushwhacking: If you are planning a hike through trailess overgrown terrain, leave the poncho at home. They tend to snag easily on branches and bushes. An affordable alternative to the above mentioned Outer Layers. Similar positives and negatives to the poncho tarp. Great on trails that are largely protected from the elements (e.g Appalachian Trail), not so good when you are journeying through exposed terrain being buffeted by driving wind and rain. 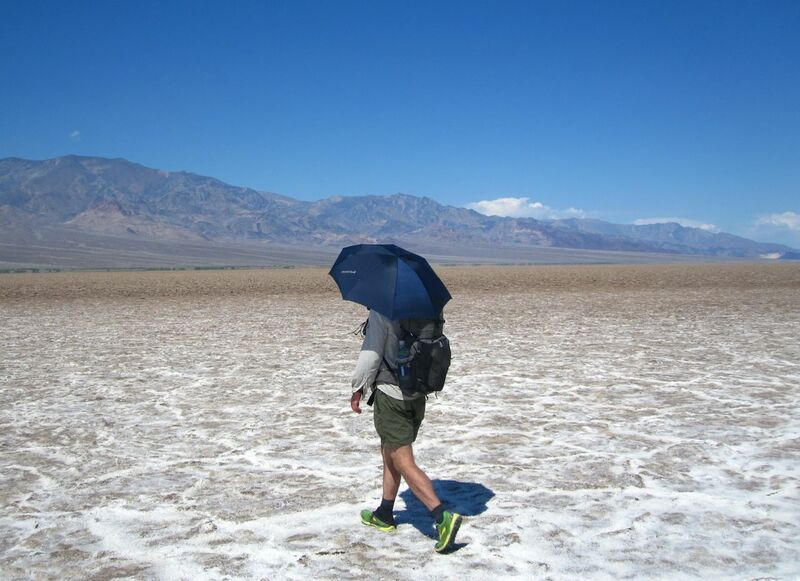 If you are hiking in desert-like regions in which the temps are regularly above 35° C (95°F), then umbrellas are hard to beat for both shade and breathability. In cold conditions, you can lose a significant proportion of your body heat via the head, hands and feet. These are the areas, which due to their high surface to mass ratio, are likely to feel the cold first. You may be decked out in the puffiest of down jackets and pants, but if your extremities are not properly protected, chances are you will be miserable. In the event that your extremities are exposed to extreme cold for an extended period, you run the risk of incurring frostnip or frostbite. In cool, three season weather a warm hat made of fleece or merino wool should provide adequate head insulation. Be sure that it covers your ears and the back of your neck. A good compliment to your warm hat is a wind or rain jacket, which has an adjustable hood with a stiffened peak. This will provide wind resistance and keep your head dry. For consistently below freezing temperatures, a balaclava made of merino wool or synthetic material, provides the ultimate in all-around warmth. Wear a hat. Wide brimmed or Foreign legion-type models both have excellent coverage. A cap or visor combined with a bandana for neck protection is also a good combination. For years I have worn an Adapt-a-cap. It is still the best sunhat I have seen. Thin liner gloves made of merino wool or a synthetic material such as polypropylene work well as a base layer. They are breathable, weigh next to nothing and can be used solo when the temperatures aren’t too cold. Merino wool, fleece or down mittens are a good choice as your insulating layer in cooler temps. If it turns out to be colder than expected, you can always use your sleeping socks as an extra layer. As an outer layer, I use eVent rain mittens, which are lightweight and provide excellent wind and rain protection. Except in consistently below freezing conditions, I forgo the insulating layer and just use the liner gloves in combination with the rain mitts. Unless you wear lightweight, breathable liner gloves, your hands will be exposed to the sun’s rays. Frequent applications of sunscreen are your best defense. Socks: Thin liner socks of merino wool as a base layer. On top of that wool blend medium weight socks. Footwear: Waterproof / breathable lightweight boots. Gaiters: MLD eVent light snow gaiters are waterproof, breathable and help prevent snow from entering in the top of my shoes/boots. Socks: Thin liner socks made of synthetic or synthetic wool blend materials. Such models are breathable, wick moisture away from the skin and are quick drying. Except in below freezing temperatures, I never wear more than one pair of socks at a time. Footwear: Trail running or low-cut hiking shoes which are lightweight, breathable and quick drying. Note: Everyone’s feet are different. Make your footwear choices according to what is right for you and what is suitable for the conditions into which you are venturing. See Footwear in the GEAR and GOING LIGHT sections for details. Gaiters: If I am hiking in desert-like or overgrown terrain where debris entering my shoes is a constant issue, I will wear lightweight, quick-dry Dirty Girl gaiters, which fit perfectly over running or trail running shoes. 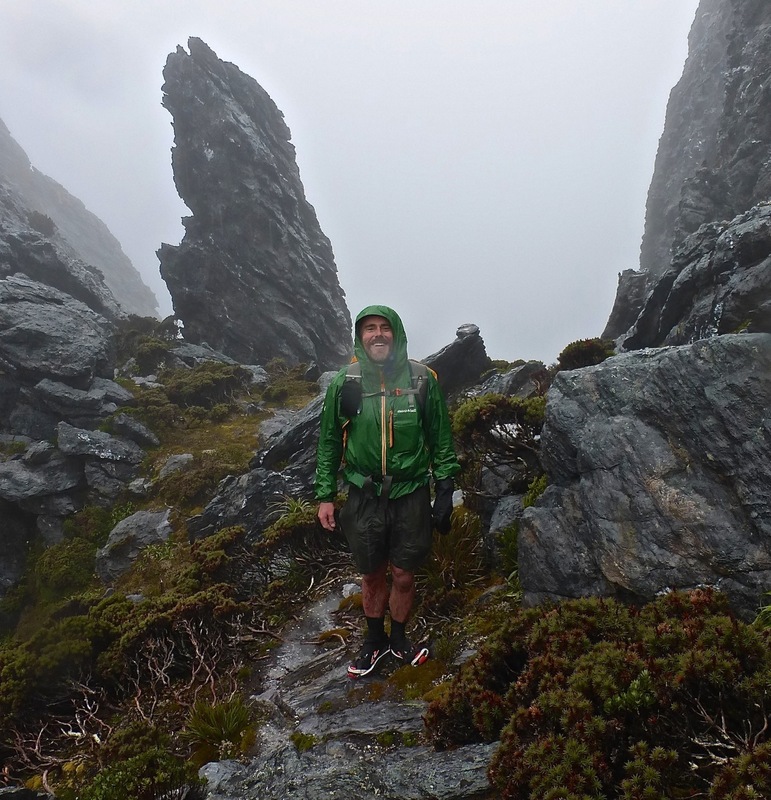 For further gear recommendations and an in-depth analysis of the layering system, check out Mark Verber’s Outdoor Clothing and Footwear.